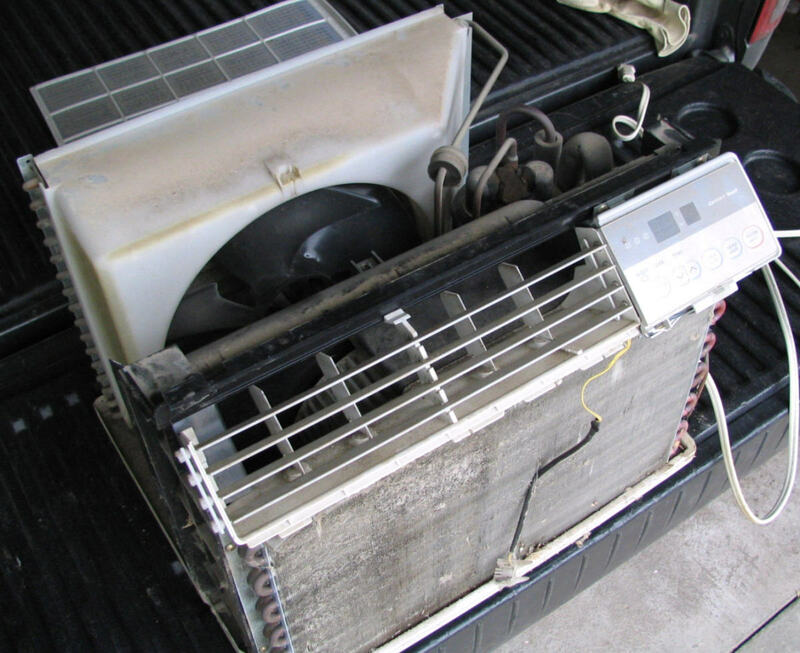 Why Does My A/C Smell Bad? Many homeowners take advantage of window air conditioners to save money on electric bills, cool down areas of their homes that the central air unit doesn’t reach, or make their room cold enough to be able to use a blanket at night. A window air conditioner can be useful for all the reasons listed above, but when dust, water, and heat are combined, they provide the perfect environment for mold and mildew growth if no annual maintenance is performed. Where Did That Mildew Smell Come From? 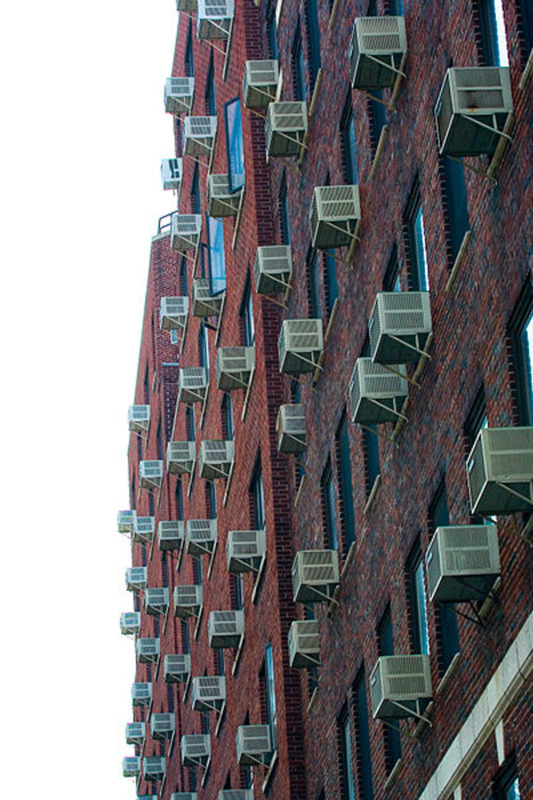 Window air conditioners have a drip tray that is a necessary component of the system. This collection of water, along with heat and dust, allow for some pretty nasty “muck” to collect over time. The smell associated with this stuff is best described as being sour, moldy, or mildewy. If there's a drainage problem, water may have pooled and mildew may have grown on the filter, condenser coil, or somewhere else inside. If the mold is black (Stachybotrys), it's toxic, and you'll want to get rid of it as quickly and thoroughly as possible. 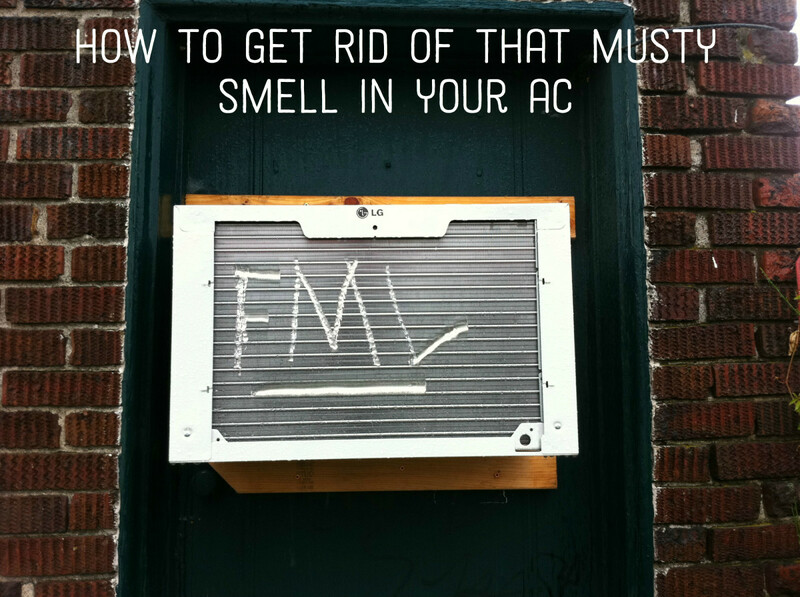 I've outlined some steps below that people take to remove the smell, but it’s always best to refer to any literature that came with the window air conditioner at the time of purchase. 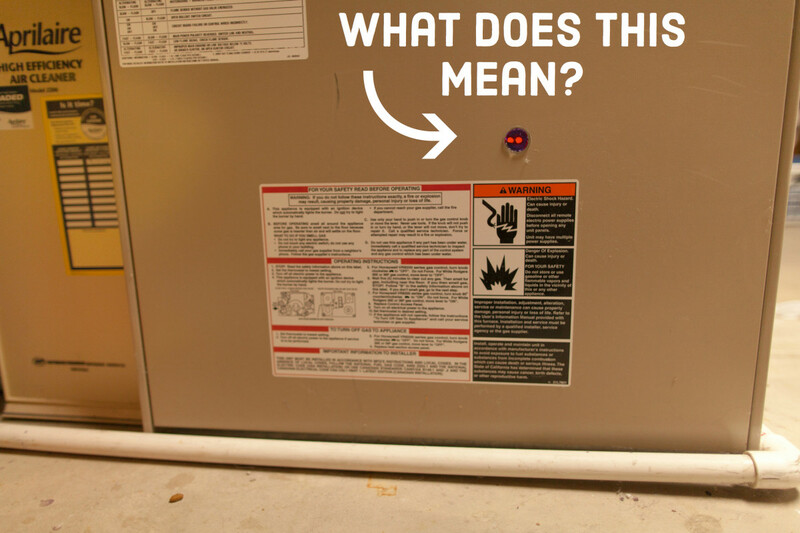 WARNING: Most window units are pressurized systems and have a charged capacitor that could cause a shock, so at no time should a homeowner remove anything other than the case, which exposes the internal components of the window air unit. Doing anything other than removing the case may result in personal injury. 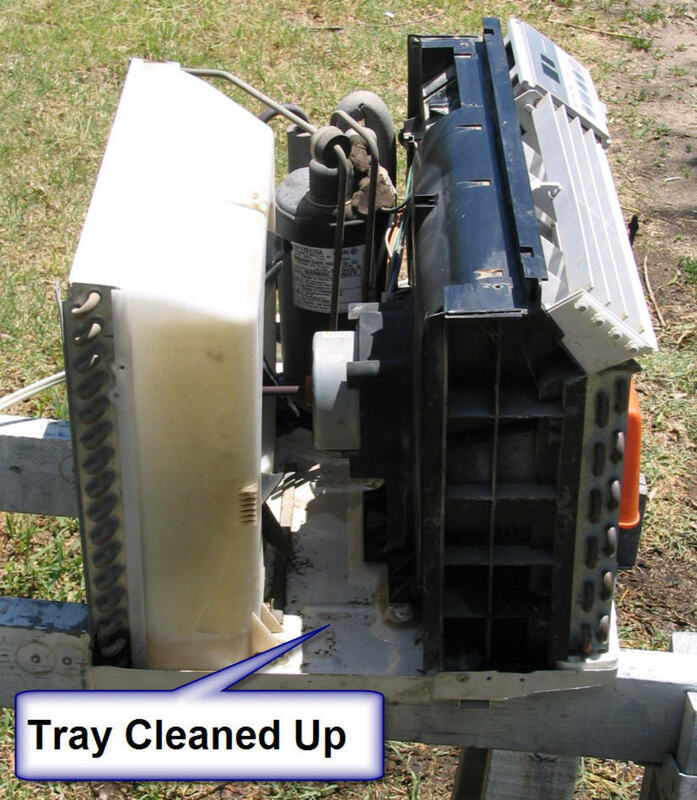 On smaller window air conditioners, remove the outer metal case of the unit. This should expose the coils, fan, and compressor. 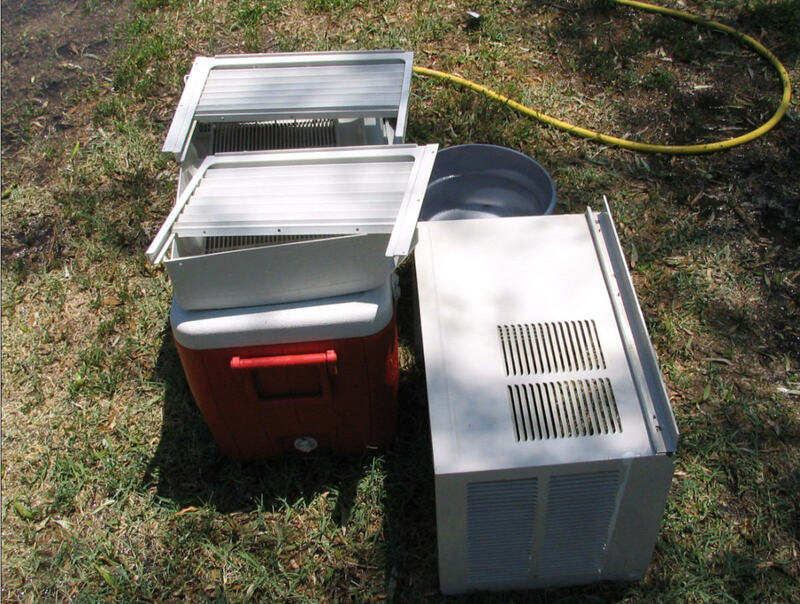 In a larger unit, after the front plastic and a few screws are removed, the air conditioner will slide out of the case toward the inside of the room. 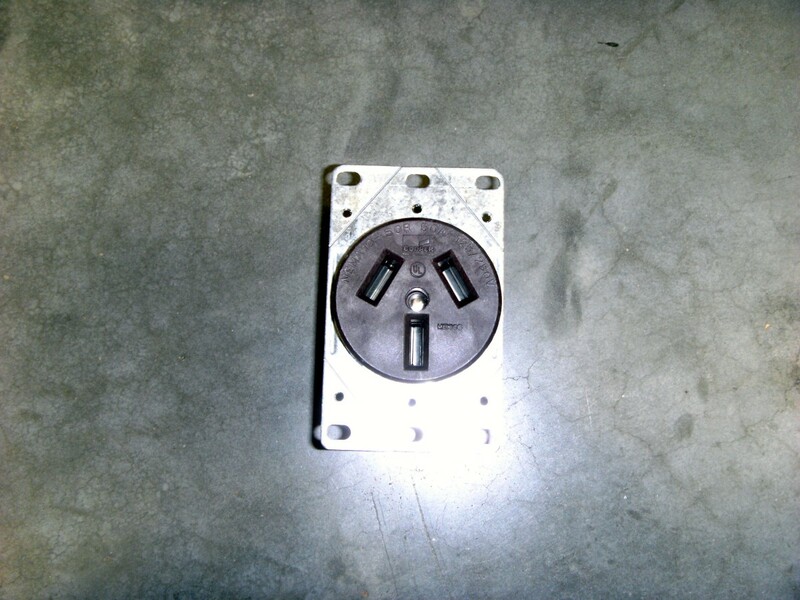 Be careful not to damage the metal fins on the front and rear of the unit. These are made from aluminum and will bend easily. Choose a location outside where a hose can be used, such as a driveway. Place the window air conditioner on something secure such as a couple of saw horses or a secure table of some kind. The table or saw horses will be exposed to water and bleach, so choose something appropriate for this task. For larger air conditioners, an assistant may be required to lift the unit. Blow the unit off with compressed air from a distance sufficient to remove dust and debris, but be careful not to damage any components or blow too hard on the aluminum fins. Wipe off any surface dust or debris with a damp cloth. 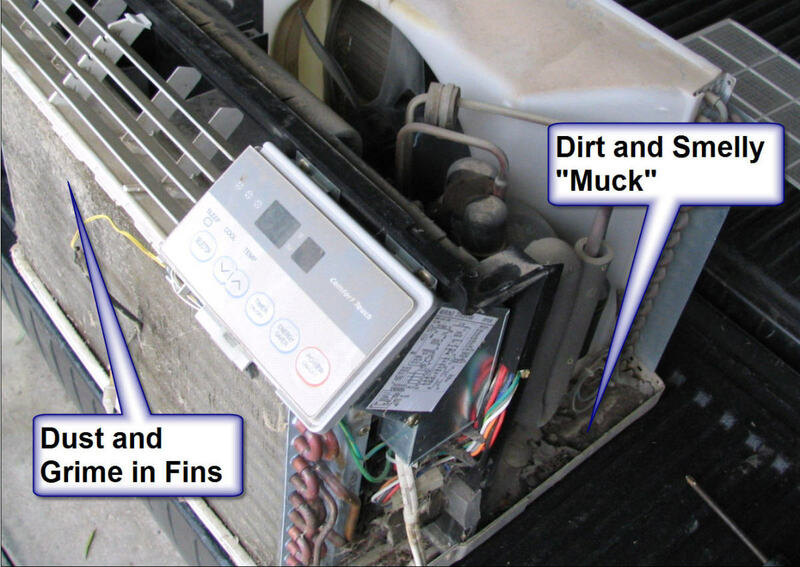 Using a soft brush such as the type used to remove lint from a dryer vent, stroke the fins up and down to remove debris caked on to the front and rear of the air conditioning unit. Fill a spray bottle approximately ¼ full of bleach and fill the rest with water. 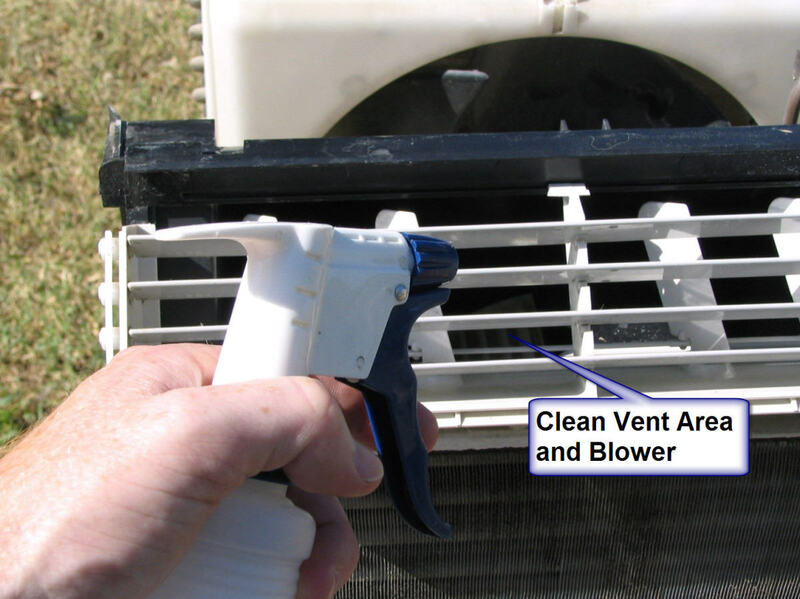 Spray directly into the area where the cool air blows out of the air conditioner. Saturate this area. Be sure to get plenty of the solution into the blower fan while turning it slowly. Once the bottle is empty, refill with water and spray in the same area. The goal here is to clean the area with bleach and water, then flush the bleach out with water. Using a hose, flush all the muck and debris out of the drip tray. Do not spray in the tray. The goal here is to use enough water to flush out the debris, but not to use much pressure. 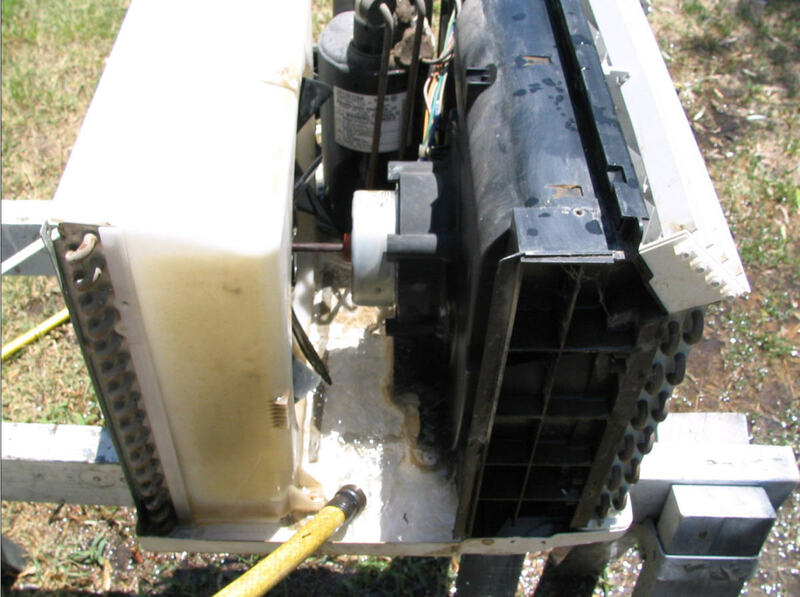 Pressurized water will damage the window air conditioner components. Flushing for several minutes is usually enough to sufficiently clean things up. Allow the unit to dry for a few hours. Inspect it closely for any damage or debris. Wipe up any remaining water with a dry cloth and wipe down any surfaces that still need cleaning. Reassemble the case in the reverse order and slide unit back into the case that it was removed from. This should be enough to remove the smell from the window air conditioner. 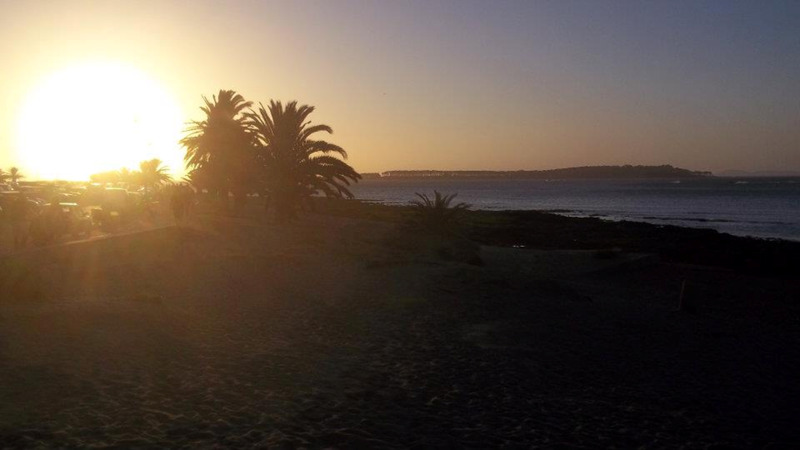 These steps should be taken at the end of every warm season. 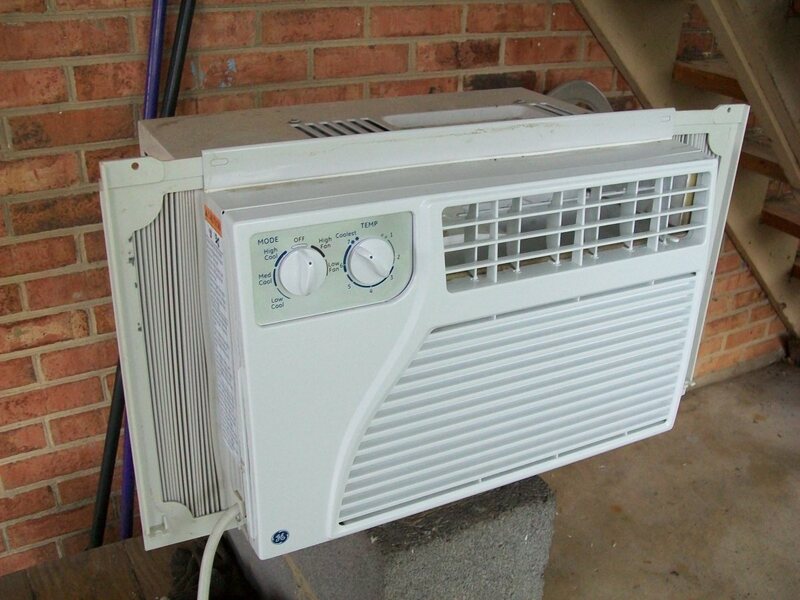 The window unit should be stored in a clean, dry location over the cool fall and winter months. 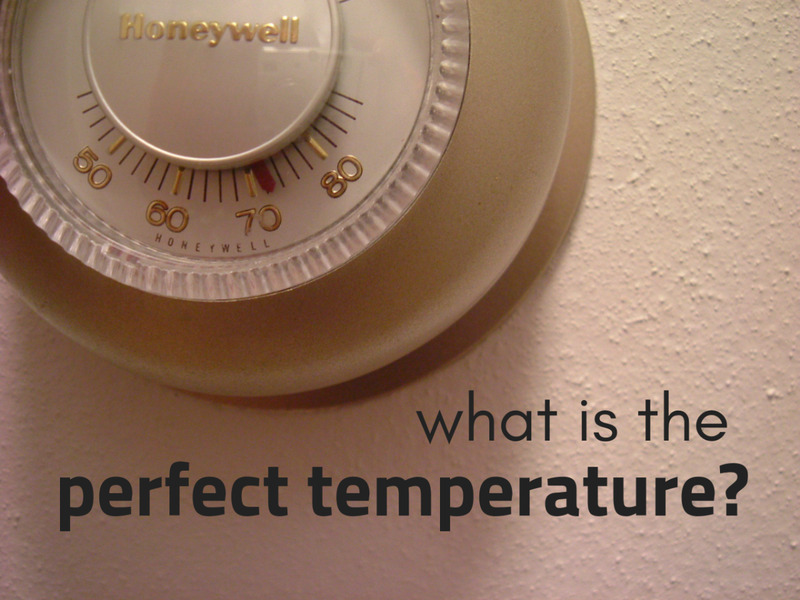 What best describes the smell when you turn on your window air conditioner? My A/C is through the wall, how can I clean it? 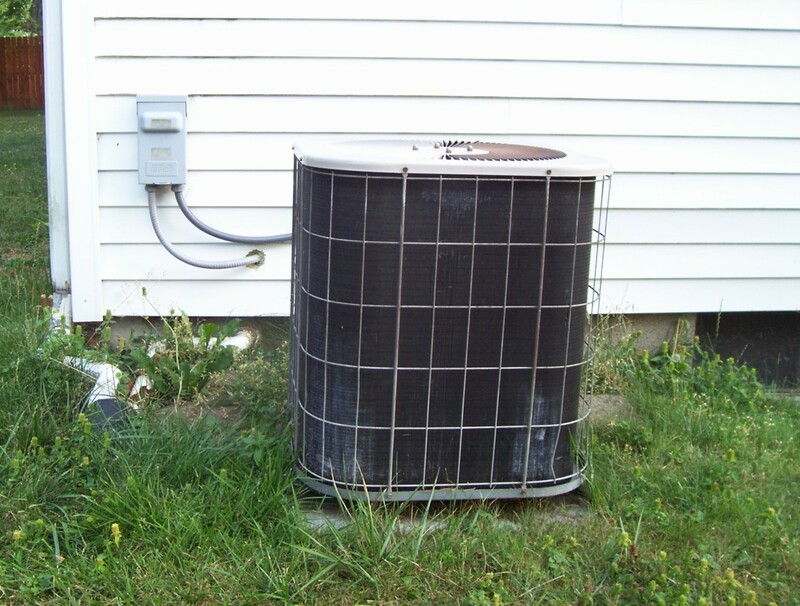 If you are unsure of what you have or how to clean it, you should contact a qualified A/C repairman to service it. I have no way to take the AC unit out of the window to clean it, so how can I get rid of the smell? Hire someone just to be safe. Can you clean a unit without taking it out of window? No. It really needs to be removed to thoroughly clean it. Ours, and probably most, require a couple of people to carry it out. They are heavy. Hire someone to help if you are not confident about any of this. Better to be safe than to injure yourself or mess up the unit. My bedroom window unit is 4months old...I get a mildew smell which lasts for maybe 5 seconds...I clean the filter,it drips properly and I dust it,too..Shall I ignore the 5sec.smell???? this works but careful where you put water. don't put it on electrical parts. There are eight steps not seven. Dealing with the "dirty sock syndrom" on two Friedrich AC units that are not even a yeare old. I cleaned the inside of the styrofoam box with Clorox and it helped for a short while. But not the smell is back again, and the box still looks clean. I can't seem to figure out where the smell comes from. Is it OK to spray Clorox or Mildew Remover right on the coil? Will that even help? I can't pull the unit outside by myself. Dirty sock syndrome is the foul, moldy smelling odor that comes from your air conditioner when you first turn it on. 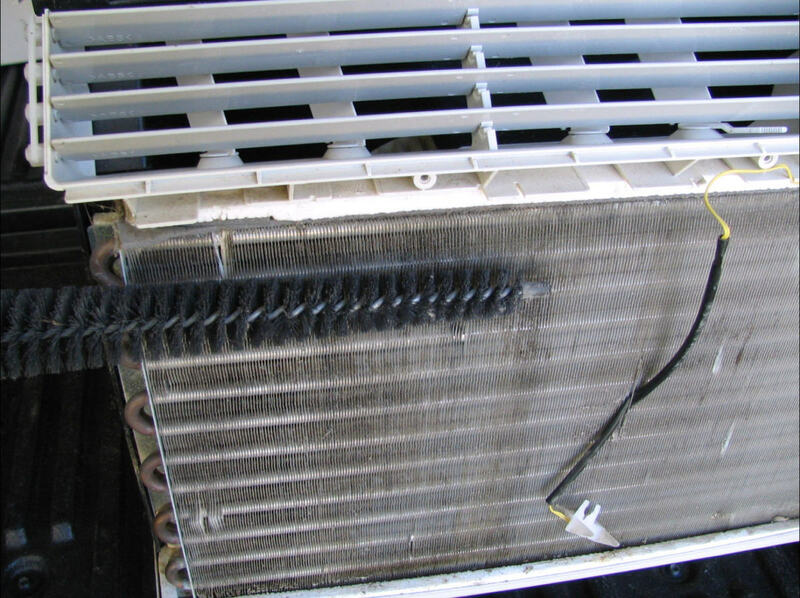 It is caused by the build up of mold and bacteria on your evaporator coil. I suggest cleaning the filter and also the coil. I took my window unit out today,put it on the driveway took the pressure washer out and cleaned it thoroughly with the pressure washer avoiding the electronics. I then blew tried it with the leaf blower for about 5 minutes. I reinstalled it in its cabinet and put a fan blowing on it for a good 6 hours. I also power-washed the inside front grill. I just plugged it in and fired it up and it smells like new and runs great. 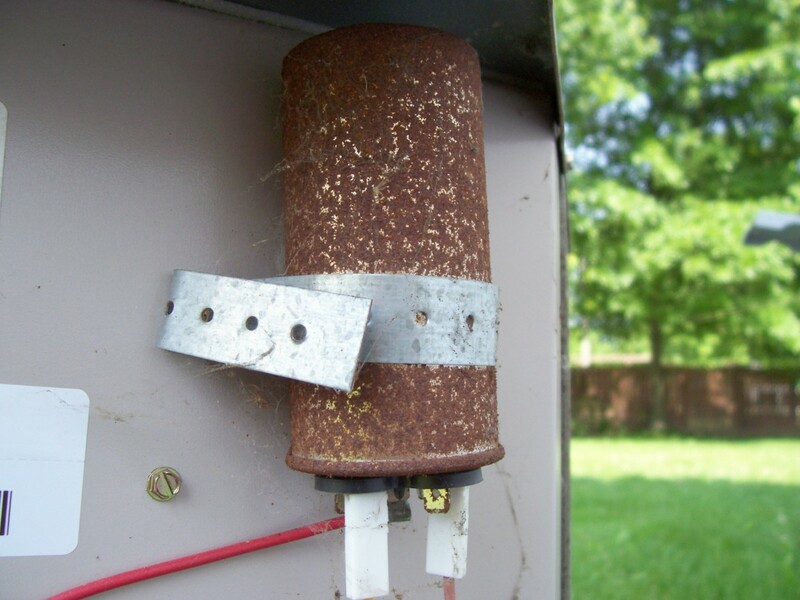 I just throw it away and get a new one.. small one new is a hundred bucks.. the humidity and heat will eventually make the new one bad.. but it takes more than one summer.. so every couple of years I just replace it. cheapie ones save on electric bill.. mine is low and we just keep two rooms cool and let the rest of the house stay hot.. we have an attic fan that draws up the heat when need to cook in kitchen.. works great and elec is around 80 bucks every month. We do this every year with ours. Hope it works for you. Just remember to take your time and don't attempt to remove anything associated with the compressor or electrical. Usually, there's a little thermostat wire connected to the front fins. This can be moved around if need be, but I wouldn't do much else. Always best to look through your manual prior to doing any maintenance and heeding any warnings. Good luck! Thanks! This took care of the bad smell.